For other uses, see Nazarene (disambiguation). 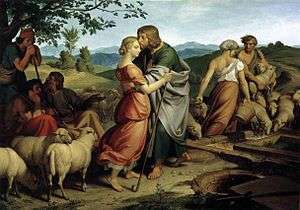 In Jacob encountering Rachel with her father's herd, Joseph von Führich attempts to recapture the mood of Perugino and Raphael, 1836 (Österreichische Galerie Belvedere, Vienna). The name Nazarene was adopted by a group of early 19th century German Romantic painters who aimed to revive honesty and spirituality in Christian art. The name Nazarene came from a term of derision used against them for their affectation of a biblical manner of clothing and hair style. In 1809, six students at the Vienna Academy formed an artistic cooperative in Vienna called the Brotherhood of St. Luke or Lukasbund, following a common name for medieval guilds of painters. In 1810 four of them, Johann Friedrich Overbeck, Franz Pforr, Ludwig Vogel and Johann Konrad Hottinger moved to Rome, where they occupied the abandoned monastery of San Isidoro. They were joined by Philipp Veit, Peter von Cornelius, Julius Schnorr von Carolsfeld, Friedrich Wilhelm Schadow and a loose grouping of other German artists. They met up with Austrian romantic landscape artist Joseph Anton Koch (1768–1839) who became an unofficial tutor to the group. In 1827 they were joined by Joseph von Führich (1800–1876) (illustration above right). The principal motivation of the Nazarenes was a reaction against Neoclassicism and the routine art education of the academy system. They hoped to return to art which embodied spiritual values, and sought inspiration in artists of the late Middle Ages and early Renaissance, rejecting what they saw as the superficial virtuosity of later art. In Rome the group lived a semi-monastic existence, as a way of re-creating the nature of the medieval artist's workshop. 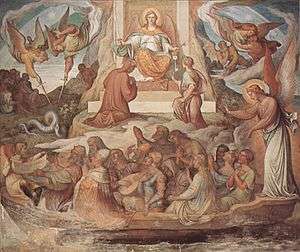 Religious subjects dominated their output, and two major commissions allowed them to attempt a revival of the medieval art of fresco painting. Two fresco series were completed in Rome for the Casa Bartholdy (1816–17) (moved to the Alte Nationalgalerie in Berlin) and the Casino Massimo (1817–29), and gained international attention for the work of the 'Nazarenes'. However, by 1830 all except Overbeck had returned to Germany and the group had disbanded. Many Nazarenes became influential teachers in German art academies. The programme of the Nazarenes—the adoption of honest expression in art and the inspiration of artists before Raphael—was to exert considerable influence in Germany, and in England upon the Pre-Raphaelite movement. In their abandonment of the academy and their rejection of much official and salon art, the Nazarenes can be seen as partaking in the same anti-scholastic impulse that would lead to the avant-garde in the later nineteenth century. Nazarenes in the "History of Art"
Cordula Grewe. "Painting the Sacred in the Age of German Romanticism." Aldershot: Ashgate Books, 2009. Lionel Gossman. “Making of a Romantic Icon: The Religious Context of Friedrich Overbeck’s ‘Italia und Germania.’” American Philosophical Society, 2007. ISBN 0-87169-975-3. Lionel Gossman. "Unwilling Moderns: The Nazarene Painters of the Nineteenth Century" in Nineteenth-Century Art Worldwide - Volume 2, Issue 3, Autumn 2003. Wikimedia Commons has media related to Nazarene movement. This article is issued from Wikipedia - version of the 9/24/2015. The text is available under the Creative Commons Attribution/Share Alike but additional terms may apply for the media files.